I was privileged to have been a participant for the past two days in a training called From Good to Great based on the book written by Jim Collins. The books highlights the distinction that make a company great which involves High Motivation and High Profits at a sustainable level. 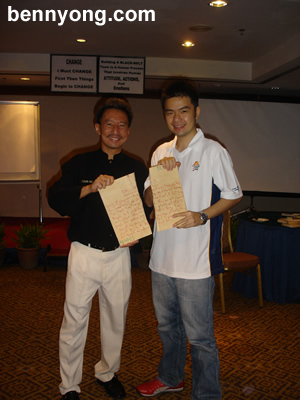 Just Before The TrainingThe training was facilitated by Mr Simon Ng of Dynamic Team whereby he combined both the principles of the book with his own training known as the Bruce Lee Power Punch Shaolin. He has a wealth of experience and handles the whole course well. whereby he combined both the principles of the book with his own training known as the Bruce Lee Power Punch Shaolin. He has a wealth of experience and handles the whole course well.whereby he combined both the principles of the book with his own training known as the Bruce Lee Power Punch Shaolin. He has a wealth of experience and handles the whole course well.Just Before The TrainingThe training was facilitated by Mr Simon Ng of whereby he combined both the principles of the book with his own training known as the Bruce Lee Power Punch Shaolin. He has a wealth of experience and handles the whole course well.The course was held at Bangi Equatorial which is a place that would never have been on my visit list. There were about 23-35 of us consisting of a majority of BTAs (GSDÃ¢â‚¬â„¢s term for Management Trainee) and a good mix of managers. To me, the training came at a perfect time as I was getting a bit sidetracked in my performance at work. Being out of the office was something healthy and what was needed. The whole two day training course made me reflect on my actions so far and managed to change me in a certain level. I will be selling you short if I were to reveal what was in the training program. This is simply to ensure that you obtain similar or even better results from the training. Some of the portion of the course was similar to what I have picked up previously in Money & You which incidentally I will miss the upcoming one in April because of work related travel. I will be off to London for a month starting this Saturday and with the learning experience at the back of my mind, I would definitely strive for excellence. Hopefully this will be working to my favor as my final evaluation is in roughly a monthÃ¢â‚¬â„¢s time whereby the outcome is whether I get to join the organization or I should try my luck somewhere else. ThatÃ¢â‚¬â„¢s all for the moment, till my next post. Do take care.